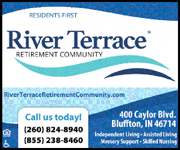 Karen F. Mastin, 70, of Huntington, IN, died Monday, Oct. 21, 2013, at 10:09 a.m. at her home. Mrs. Mastin was a 1961 graduate of Stryker High School in Stryker, OH. She earned a bachelor's degree in education from Huntington College in 1965 and a master's degree from the University of Saint Francis. She was a teacher for 30 years and attended College Park United Brethren Church. She was born Oct. 4, 1930, in Bryan, OH, to Harley and Clela Bowers Headley. Survivors include two daughters, Dawn (L.J.) Chesterman, of Huntington, and Tiffany (Colin) McCampbell, of Rapid City, SD; a son, J. Scott Mastin, of Bryan, OH; a sister, Joan Headley, of St. Louis, MO; a brother, James (Judy) Headley, of St. Louis, MO; six grandchildren; and one great-grandchildren. 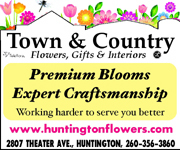 Calling is Thursday, Oct. 24, 2013, from 3:30 p.m. to 6:30 p.m., with a service following at 6:30 p.m., at the Myers Funeral Home Huntington Chapel, 2901 Guilford St., Huntington. Rev. Gary Dilley will officiate. 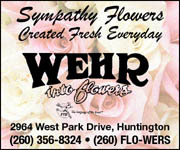 Interment will be at Lock Port Cemetery, in West Unity, OH. Memorial gifts may be made to the College Park United Brethren Church Benevolent Fund in care of Myers Funeral Home. 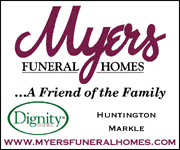 To sign the online guest registry, visit www.myersfuneralhomes.com.